Glenco Air & Power’s selection of high-quality electric rotary screw air compressors are designed feature-rich and proven reliable to meet the demands of all industrial applications. Customers who want only the very best for their business can choose from the made-in-Germany ALMiG range knowing that their investment is protected by a 5-year warranty. 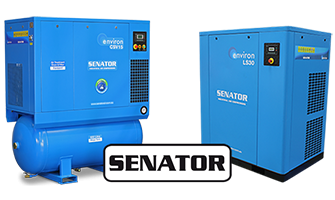 While those who are more focused on the initial cost outlay are spoilt for choice by the Senator range that offers unsurpassed value for money. Both ranges include high-efficiency variable speed drive models that are guaranteed to reduce your electricity costs. And Glenco’s network of experienced dealers is always there to provide you with the right advice and outstanding product support.